– Create Views that are just used for printing and once they work do not edit them or use them for day-to-day maintenance of the schedule. – If you wish to fit a schedule to one page wide it is usually best to make sure that most of the schedule fits onto the screen, or at least that the columns and bars each do not occupy more than 2/3 of the screen. – Try printing to a pdf writer with an A3 or 11” x 17” paper size and then reduce the paper size when printing to an A4 or Letter paper size. – Select the Tools, Options…, Edit tab and select a narrow format for the durations; for example, use “d” and not “days”. – Select the Tools, Options…, Edit tab and uncheck the Add space before label option. This will remove the space between the duration value and units. – Consider increasing the row height so the Task Name column width may be reduced and text displayed on two or more lines. 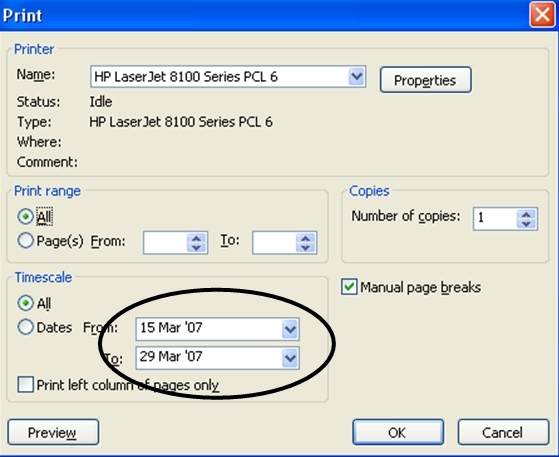 A date range may be selected from the Print form. In earlier versions of MS Project, this had to be selected from the File menu, but in later versions these dates may be edited by selecting Print from the Print Preview form. These dates are saved with the View so you may wish to consider creating a view for each date range. In addition, a filter may be created to remove tasks that are not in the date range to be printed. Eastwood Harris Supplies Project Management Training Manuals, Project Management Training Presentations and Consulting on Primavera P6 and Microsoft Project 2010 in Sydney, Melbourne and Brisbane.